French PM Francois Fillon has said that youths who have rioted for two nights in the Paris suburbs are "criminals". Extra police have been deployed in case trouble breaks out for a third night, after 80 officers were reported injured in clashes on Monday. President Nicolas Sarkozy has called an emergency meeting for Wednesday on his return from a trip to China. The youths said they were avenging the death of two teenagers killed when they were hit by a police car on Sunday. Police say some officers suffered bullet wounds, while others were hurt by stones, fireworks and petrol bombs thrown at them in Villiers-le-Bel. They responded with tear gas and rubber bullets. "I'd like to pay tribute to the police, who had an extremely difficult night," said Mr Fillon. "Those who shoot at police are criminals and they will be treated as such," he added. Funding outlined for community projects in "sensitive areas"
Mr Fillon, who visited the scene on Tuesday morning, said nothing could justify the attacks. Relatives of the two dead teenagers insisted that police had rammed their motorcycle, and then abandoned them to die. However, police say the motorcycle was going at top speed and was not registered for street use, while the two boys - who have been named only as Moushin, 15, and Larami, 16 - were not wearing helmets and had been ignoring traffic rules. The number of police injured in the clashes is unusually high and the violence more intense than that which gripped the country for weeks in 2005, police unions have said. "Two things are cause for anxiety," Douhane Mohamed of the Synergie police union was quoted as saying by the news agency AFP. "Signs that the violence is spreading to neighbouring areas, which have already had their share of burned cars, and the almost systematic use of fire-arms against police." The BBC's Alasdair Sandford says there is a lot of anger in Villiers-le-Bel that an initial results of an internal police enquiry suggest officers were not to blame for the crash. He adds that although plenty of money has been poured into areas like Villiers le Bel - an equal opportunities law was passed designed to combat discrimination and to boost job opportunities for young people - that seems irrelevant when resentment between young people and the police seems worse than ever. Correspondents say a third of the 26,000 inhabitants in Villiers-le-Bel are under 24 and jobs are hard to come by. There are also signs that children as young as ten on bikes acting as spotters and a youth with a scanner tuned to police frequencies to keep one step ahead of the police. Interior Minister Michele Alliot-Marie has said the riots were organised and criminals were using youngsters to lure away police while they pillaged shops. But she denied that the riots were spreading. 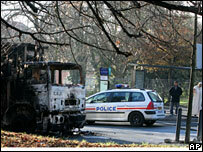 The 2005 unrest, sparked by the accidental deaths of two youths, spread from a nearby suburb of Paris to other cities and continued for three weeks, during which more than 10,000 cars were set ablaze and 300 buildings firebombed. Mr Sarkozy was heavily criticised two years ago after he called for crime-ridden neighbourhoods to be "cleaned with a power hose" and described violent elements as "gangrene" and "rabble". He has called a security meeting for Wednesday, after his return from a trip to China. "It is going to take us a generation to transform things in these difficult neighbourhoods - housing, jobs, security," Nadine Morano, spokeswoman for Sarkozy's Union for a Popular Movement (UMOP) told AFP. The second consecutive night of rioting began early in the evening in Villiers-le-Bel, the northern suburb that saw most of the violence on Sunday. 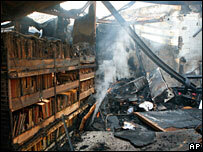 More than 70 vehicles and buildings, including the municipal library, two schools and several shops, were set on fire. Violence was also reported in four other towns across the Val d'Oise department. On Sunday, about 30 cars and several buildings, including a police station, were torched in Villiers-le-Bel and neighbouring Arnouville. Twenty-six police and firefighters were injured and nine people were arrested. The violence happened despite appeals for calm from the families of the two teenagers of Algerian origin whose deaths sparked the violence on Sunday evening.